I just finished my 2nd Marathon on Sunday, March 19, 2017. It took me 5 hours and 26 seconds to go 26.2 miles. GPS evidence here. 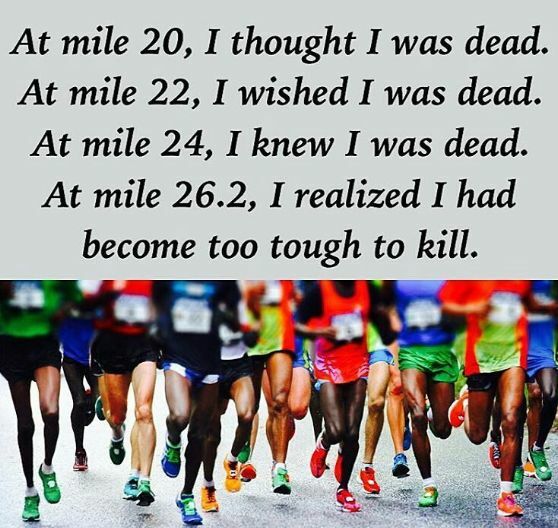 A lot can happen over 5 hours and 26.2 miles. At one point, I felt a sharp pain in my right knee and had to stop completely. I was 19.5 miles into the race, with only a few other runners around, and no aid station in sight. I felt a sharp pain in my knee, stopped, adjusted my knee brace and started walking gingerly, sort of hobbling a bit. I didn't know if I could even finish the race. What if I had cracked a bone or torn a ligament? I PERSISTED. I walked up the steep hill only to find a steep decline. I usually fly down hills, but with my knee in pain, I slowly made my way down the hill. At the bottom of the hill, there was another steep uphill climb. At this point I decided to stop thinking about the pain. I needed to focus on my goal of finishing this marathon. Once I decided to stop thinking about the pain, the pain subsided. I kept working to increase my speed, little by little; from a slow walk, to a fast walk, to a slow jog, and by the time I reached the last mile, I was passing others, and triumphantly crossed the finish line. The truth about running a marathon is that it is a personal test of training, discipline, mental toughness, and perseverance. Prior to the marathon, I completed a 16-week training program that included 4-5 runs/week totaling about 30 to 40 miles per week. I also completed 3 half-marathons the previous year. I estimate that I ran over 71 hours during my 16 week training. The best piece of training advice I got about training for a marathon was on a YouTube video about strengthening abs. This video essentially explained that after running 20 miles, most runners want to hang their heads down and slouch over. Slouching is one of the worst things that you can do while running a race. It reduces oxygen to your body and brain! To prevent this, it is important to cross train, specifically strengthening abdominal muscles. It's not just about running, although that is very important, it is also about getting into the best shape of your life! We all know what discipline means, giving up something today for a bigger goal or reward later. Discipline in marathon training included giving up other fun activities to complete my training runs, and watching my diet and beverage consumption. As a night person, I'm amazed at how discipline always includes going to bed early and waking up early in the morning, no matter the goal. Completing a marathon is not just about your fitness level. Your body will want to give up, and it's your brain that will have to convince your body to keep going. When I decided to run this marathon, I told my friends (for accountability) and I had to mentally block the naysayers and remember the encouragement. 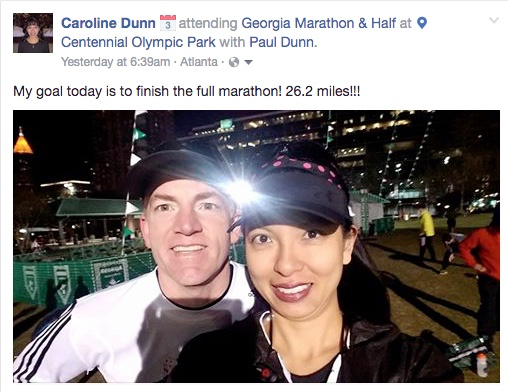 The morning of the marathon, I announced on my Facebook page that my goal was to finish the marathon. I was keeping myself accountable and I clearly stated my intention. Finish the marathon! As I mentioned at the beginning of this article, at one point in the marathon, I felt a sharp pain in my knee and didn't know if I would finish the marathon. I made a decision; I decided to stop focusing on the pain, and start focusing on my goal. I repeated positive affirmations in my head, over and over again. There's a massage waiting for you at the end. As I approached the final half mile of the marathon, I saw my husband, Paul Dunn just ahead of me. I ran up beside him. We held hands headed for the finish line. No, this story doesn't end the way you think it will. I started running faster and pulled him along. He encouraged me to let go of his hand so that I could make my best marathon time. I let go and raced for the finish line. I'm so fortunate to have a husband to encourage me, even though it meant that I finished before him. My husband is actually the faster and stronger runner, but after 26 miles, my mental toughness and persistence took over and got me over the finish line. Thank you Paul Dunn for your love and encouragement throughout this journey. Thank you to my running coach, world ranked and All-American track athlete, Tina Klein. Thank you to the folks at the Lululemon Perimeter Mall store. They gave me the awesome running shirt that I wore during the marathon as part of their Sweatbox promotional event. Thank you to the hundreds of volunteers that make this event happen, especially Amanda Childs who stood on Spring Street for 7 hours . Thank you to all of the spectators for your cheering and encouragement, especially Dave and Andrea Morgan for taking an awesome picture of me (cover photo for this article). Thank You Aubriana Lopez of CryoClub Atlanta for the complementary cryotherapy session! Thank you to the officers that stopped traffic to keep me safe during my journey. Apologies to all of the drivers who had to wait for me to run a five hour marathon. Thank you to all of the medical support personnel and volunteers. I'm glad I didn't need to visit you during the event. Thank you Atlanta Track Club for putting on this event and offering the Ultimate Peach designation (Completing the Peachtree Road Race, Atlanta 10 Miler, Thanksgiving Day Half Marathon, and Georgia Marathon).